Friendly and highly sociable, those born with Venus in Aquarius enjoy cultivating a diverse collection of acquaintances from many different walks of life. The more unusual someone is, the more interesting they are likely to appear to Venus in Aquarius people. Ordinary, run-of-the-mill folk simply don’t offer them enough mental stimulation and normally end up boring them to tears. Having a strong intellectual connection with their friends and lovers is very important to Venus in Aquarius people, and usually far more so than having a close emotional rapport. Detached and somewhat impersonal, these Venus types can often come across as lacking in warmth and empathy. They prefer to avoid intense emotional attachments because of the restrictions these impose on their freedom. 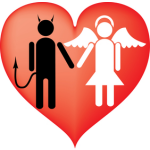 Clingy, possessive, mutually controlling relationships are their idea of hell! Venus in Aquarius individuals primarily seek partners who will allow them plenty of personal space. In turn they’re exceptionally tolerant, allowing and undemanding towards their lovers, jealousy being an emotion that is often entirely foreign to these Venus types. Venus in Aquarius people love exploring alternative ideas – and the wackier and more thought provoking the better! Challenging the status quo, breaking through social taboos and stretching the boundaries of acceptable behavior figure among the main ‘raisons d’être’ of Venus in Aquarius types. These individuals detest bourgeois values and tend to establish their own somewhat unconventional rules of social conduct. Strong believers in the ‘brotherhood of man’ and the equal rights of all humanity, they like to treat everyone they meet with the same degree of respect and friendliness. Venus in Aquarius types are big social animals and love being part of a large group where they can interact with a wide variety of different people, albeit at a rather superficial level and without having to get too close. Those with Venus in this sign place a very high value on their personal liberty and independence, and tend to be happiest in mutually allowing, ‘open’ relationships. Cool trendsetters who like to be one step ahead of the crowd, both culturally, artistically and sartorially their tastes veer towards the eccentric and the avant-garde. Tolerant and unprejudiced; respectful of others’ rights and freedoms; non-possessive and allowing; friendly and sociable. Overly detached and impersonal; shy away from close emotional involvement; easily bored and fickle; put personal freedom before commitment. People with Venus in Aquarius are sexually attractive to those with Mars in Aquarius, Gemini, Libra, and Leo. This short report tells you about Venus in Aquarius - but would you like a more comprehensive personality profile for yourself or your partner? Why not try our insightful Cupid's Promise and Sympatico personalized in-depth reports?